Ladies and gentlemen, boys and girls, the streaming media device you’ve been clamoring for is finally back in stock on Amazon. 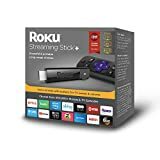 The hot new Roku Streaming Stick+ was released on October 8th and it’s been sold out ever since. It’s certainly understandable, of course, since it’s a tiny little dongle that packs as much punch as a set-top box. It supports 4K streaming and HDR, and yet it’s still less than half the price of an Apple TV 4K. If you’ve been waiting for the chance to get your hands on one, today is the day you’ve been waiting for.